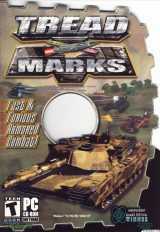 This is an incredibly addictive battle tank combat and racing game that is similar to classic BattleZone, but a lot more sophisticated and fun. It's a deserving winner of 3 awards in the second annual Independent Games Festival. In the not-so-near future, a horde of sentient battle tanks become tired with the futile wargames humans force them into, and go off to play their own, involving off-road racing and live ammunition. Over 30 venues have been included, each possessing their own unique visual style and effect on gameplay. For instance, hitting a jump while on the Moon track will keep you airborne much longer than it would on other courses. Racing on the Armageddon track is a dangerous proposal, as matter bombs and nuclear missiles are routinely fired from random points on the map, obliterating every player at least once or twice. As might be surmised from its name, the Jumper track is replete with small hills, rendering racing combat as difficult as trying to play darts while skiing over moguls. Consider that you can deathmatch on all 33 racing tracks as well as the 19 other deathmatch-specific levels, and you're left with more than enough real estate to keep you entertained for a very long time. Weapons, once collected, attach themselves to a particular spot on your tank, although the exact location depends on the type of device. Turret-mounted weapons are just that: implements that fire in the direction of your turret. These include such traditional weapons as the machine gun and laser, as well as some unconventional ones, like rocket grenades, concussion missiles, and dirt ball cannons. Alternatively, there are hull-mounted weapons, such as the cruise missile, the heavy flamer, and plasma mines, which fire in the direction the tank is pointing. Each means of destruction possesses its own unique tactical advantages and disadvantages, which, combined with the random nature of the spawning, keeps you on your toes. One of its most unique qualities - its staggeringly deformable terrain, which is virtually a feature in itself. A track that you might have been familiar with at the beginning of the race is guaranteed to be a totally different beast by the time you cross the finish line. The highly destructive weapons not only gouge chunks out of your hull, but out of the very land as well. The extremely dynamic nature of the terrain provides a completely new set of challenges, and as such keeps gameplay new and fresh. On Jan 20/2017, the game was made freeware.